What lies ahead for these mortgage companies? 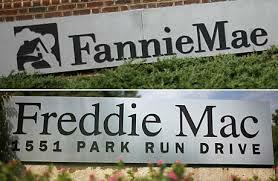 Hedge fund managers including New York based Paulson & Co are anxious to see Congress abandon their plan to terminate the government backed mortgage companies Fannie Mae (FNMA) and Freddie Mac (FMCC). Investors are gobbling up preferred stock which has been thought of as worthless for quite some time, say observers who are privy to the negotiations now going on. Due to the fact that the two mortgage companies have been doing much better of late, hopes among shareholders that these firms can be renewed as viable private entities have been kindled. Not only are investors motivated to buy shares, but they are also pressing the government to keep these slowly blossoming companies alive. Lawmakers from both sides of the aisle, as well as US housing officials are saying that Fannie Mae and Freddie Mac are on the chopping block, and will remain there. This acknowledgement has not deterred investors however. Preferred shares of Fannie Mae have surpassed doubling in their value since the beginning of March, closing yesterday at $4.75 per share. Meeting with the Senate Banking Committee and members of the staff in the House of Representatives was Paulson & Co, among other hedge fund managers.